Leanna was born and raised in Prineville, Oregon and eventually moved to Portland, Oregon to continue her education. She graduated from Portland Community College with a 4.0 GPA, and is currently enrolled at Portland State University where she is majoring in Biology with a minor in Public Health. She discovered early that she wanted to help people and eventually become a doctor. Two years into school, Leanna explored EMT classes so she could gain healthcare experience, and never thinking that she would enjoy being in EMS with the lights, sirens, and anxiety. But not only did she enjoy it, she excelled at it! Shortly after receiving her EMT certification in 2014, Leanna joined Metro West Ambulance (MWA) as a member of the BLS team. Leanna stepped up to become a Field Training Officer (FTO) at MWA in the Wheelchair Transport Department, which allows her to polish her patient skills. Leanna cherishes moments such as holding patients’ hands when they’re scared or making balloon animals out of gloves for a smile. A career filled with patient care and focus rather than emphasis on emergencies, Leanna believes, can get personnel through the long days, failures, and heartbreak that is inherent in EMS. Teaching providers to stay compassionate while doing the hardest jobs imaginable is paramount to Leanna. Leanna represents the BLS division and Vehicle Service Technicians on the Infectious Disease Control Committee. She created an infectious control guidebook for all of MWA as well as a specialized quick guide to protect new EMTs. Additionally, she submitted a proposal to change EMT training in the ALS division to cultivate leadership among new medics. She has also been an Activity and Skills Provider for People with Disabilities. 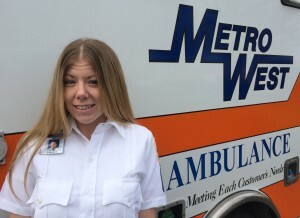 Leanna is a great asset to EMS, to MWA, and to the communities in which she serves. Leanna’s long-term focus is to become an emergency medical doctor, then eventually the medical director of an EMS agency. She is completing her medical school prerequisite classes now with a 4.0 GPA, and plans on taking the MCAT during the summer of 2016. One of her future goals is to make burnout uncommon among providers by changing the focus of EMS from emergencies to patient care. In the field, she has been a major part of amazing acts of heroism, compassion, and skill, but she’s also seen the toll this industry has on providers.